Hindus, Christians or Ahamadis not the factor, Minorities are being finished totally in Pakistan. Declare Pakistan as a Barbaric State. 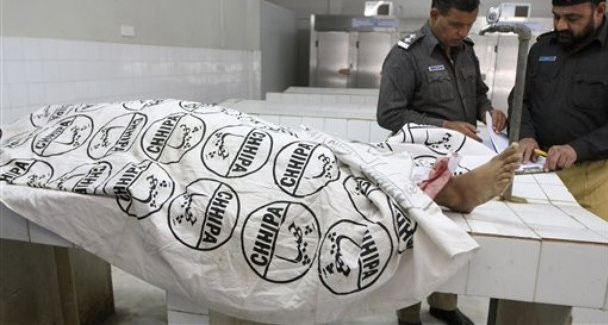 Fanatic Muslims target Lahore’s Ahmadi worshippers in Mosque on Friday; 80 dead, 100 injured. LAHORE: Gunmen attacked worshippers from the Ahmadi community in two worship places of Lahore on Friday, taking hostages and killing at least 80 people, officials said. 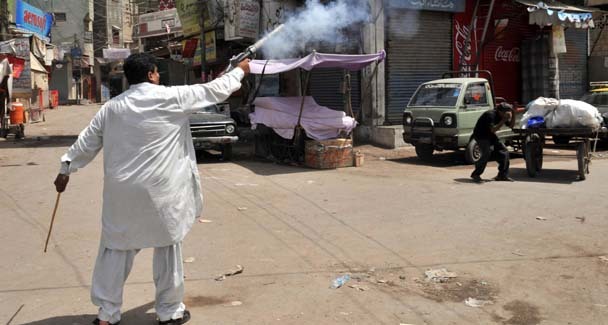 The gunmen opened fire shortly after Friday prayers and threw what could have been grenades at two Ahmadi worship places in residential neighbourhoods in Pakistan’s cultural capital. Sajjad Bhutta, deputy commissioner of Lahore, said at least 80 people had been killed in the twin attacks on worship places in Garhi Shahu and Model Town. A total of 100 were injured. The death toll at Garhi Shahu was higher, Bhutta said, because three attackers blew themselves up with suicide vests packed with explosives when police tried to enter the building. Police are still searching the area as two attackers were still at large. Prime Minister Yousuf Raza Gilani strongly condemned the attacks, expressing “deep sorrow and grief over the loss of precious lives”. Punjab Chief Minister Shahbaz Sharif said the incidents would generate greater resolve to combat extremism. He said one attacker had been arrested. Police in Model Town confirmed one gunmen had been arrested and another killed. 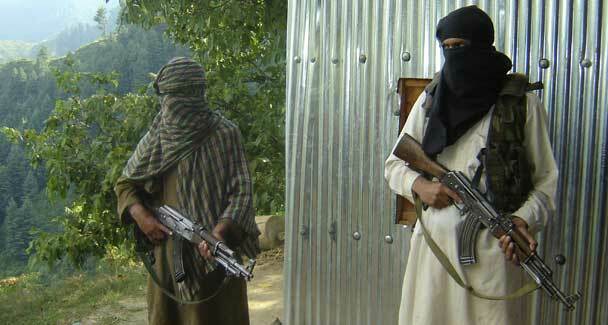 There was no immediate claim of responsibility, but suspicion quickly fell on the Pakistani Taliban. Punjab’s Law Minister Rana Sanaullah said the arrested attacker was a teenage Pashtun. This, he said, indicated a link to the tribal area of Waziristan and strongly hinted at a Taliban link. “The prayer leader was giving a sermon when we heard firing and blasts. Everybody stood up and then two gunmen barged into the place of worship and sprayed bullets,” Fateh Sharif, a 19-year-old student, told Reuters from Model Town. “They had long beards. They were carrying rucksacks.” Bhutta said a suicide vest laden with explosives was recovered from the Model Town worship place, where some attackers escaped. One fired at a television van before the area was made safe. “He was young, clean-shaven. 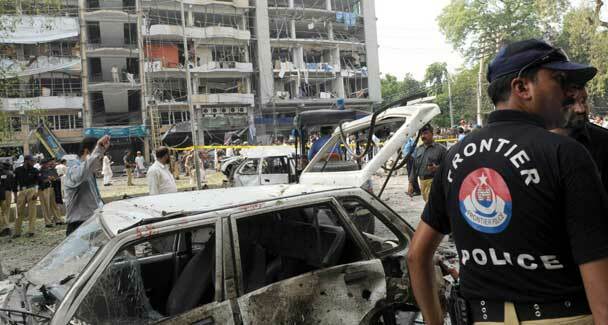 He sprayed bullets at our van while fleeing the scene,” Rabia Mehmood, a reporter told Reuters. Witnesses said the assaults were launched shortly after prayers. “I saw some gunmen run towards the Ahmadis’ place of worship and then I heard blasts and gunfire,” Mohammad Nawaz, a resident, told Reuters. The Human Rights Commission of Pakistan (HRCP) said it had warned of threats against the Ahmadi community centre in Lahore for more than a year and demanded “foolproof security and protection” from the government. It expressed concern over “the increasing sectarian dimension” of militancy in Pakistan, which it called “a big security threat to the entire society”. Friday’s shootings were the worst attacks in Pakistan since March 12 suicide attacks seconds apart killed 57 people in Lahore while targeting the Pakistani military. Nine attacks have now killed more than 220 people in Lahore over the past year, a historical city, playground for the elite and home to many top brass in Pakistan military and intelligence establishment. Hindus, Christians or Ahamadis are not the factors. Minorities are being finished totally in Pakistan. The eye-washing statement made by US condemning the present attack on Ahmadis can not refrain US from enhancing the budget to prompt Pakistan against India or anybody coming under the classification of Kaffirs. Rather an authoritative support in America may help the fanatics to build a colosal Mosque near Ground-Zero. No Fatwa from Deoband or Al Harmain or from any place contained any meaning that Islamic Jihad is different from Terrorism. Islam is the Green Book of the Fanatic Jihadis. Islam is against Peace. Islam is inhuman. Simply Barbaric Terrorism. Declare Pakistan as a Barbaric State. Two killed in Quetta rickshaw blast, Several females and children seriously injured. 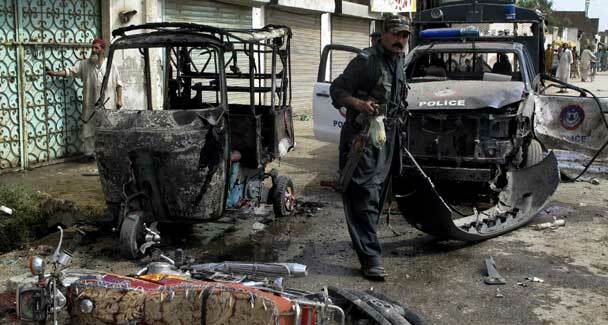 QUETTA: Two persons were killed and 14 others, including three females and seven children, were injured — some of them seriously — in a powerful bomb explosion in a rickshaw parked on the Airport Road here on Monday. Police said the explosives device, presumably planted in the rickshaw parked near the offices of the National Highway Authority (NHA), went off with a big bang at 7:10 pm. It caused injuries to some 14 people present there as the splinters of the device hurt them. The Edhi ambulances and some private vehicles carried the injured to the Civil Hospital. Two of the injured succumbed to their injuries before they were provided any medical aid. While others, including three females and seven children, were admitted to the hospital, where the condition of some of them is stated to be precarious. 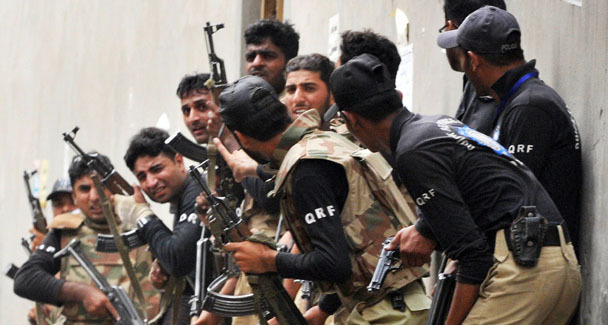 On being informed, the police and the Frontier Corps (FC) reached the spot and cordoned off the area. The nature of the explosion could not be ascertained immediately. Further investigations are under way. 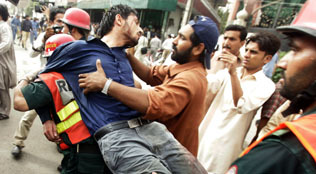 A large number of people and relatives of the injured reached the hospital soon after the incident. 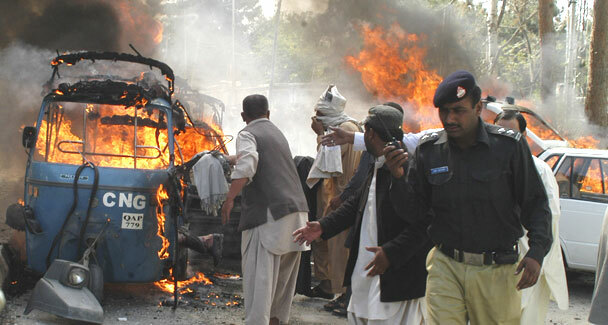 Meanwhile, Balochistan Chief Minister Nawab Muhammad Aslam Raisani strongly condemned the blast and the loss of lives. He ordered an inquiry into the incident. The chief minister asked the authorities concerned to provide all possible health facilities to the injured. QUETTA: A number of schools, including at least two girls’ schools, have closed down in Quetta after threatening letters were received by their managements. Security was also beefed up in parts of the provincial capital and in Mastung. Some of the letters threatened that if purdah was not observed in schools, then teachers and administrative heads will have to bear the consequences. 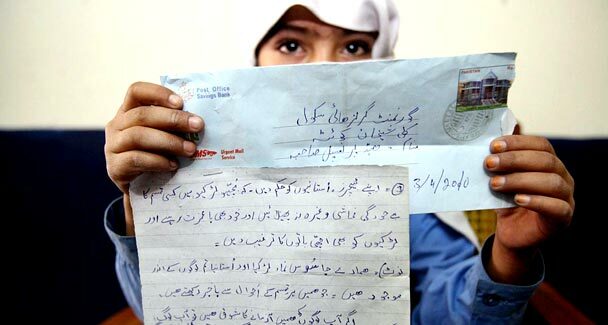 Similar letters threatening against wearing ‘western’ clothes were also sent to schools in Mastung. The letters warned the school managements with the presence of informants among the students and the staffers and threatened severe consequences in case of non-compliance. The letters, sent by Tehrik-i-Taliban Pakistan’s Balochistan chapter, created a sense of fear and panic among the students and teachers. Tortured Hindu Minorities in Pakistan :: The Cruel Face of Islam. 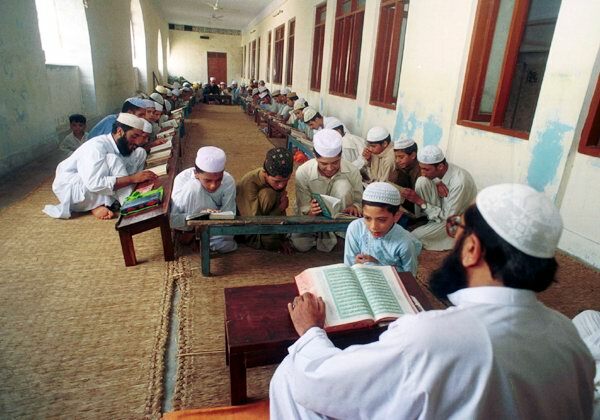 Students recite lines at a Madrassa in Pakistan to learn persecution upon non-muslims. -File Photo. Islamabad, Pakistan (CHAKRA), Tuesday, May 11th, 2010( This report is published on the basis of news received late) – A Punjabi Hindu girl from Pakistan has been kidnapped and is being held in a madrassa where she is being forced to convert to Islam. This has been brought to attention by leading Pakistani activist Ansar Burney. Burney’s rights organization has learned that 15-year-old, Gajri who is daughter of Meghna Ram was abducted from her home in Katchi Mandi on December 29th 2009 by a nearby Muslim neighbour. This took place in the Liaquatpur in the Rahim Yar Khan District. According to Burney, Gajri’s parents later found out that she was being held in a madrassa where she has been forcefully married off to someone in addition to being forced to convert to Islam. The local administrator of the madrassa is refusing to speak to anyone regarding the abduction and Gajri is not being allowed to leave the madrassa resulting in not being able to speak to her parents or family members. Burney, a former human rights activist openly condemned the forceful act of conversion in addition to the kidnapping. He has demanded her immediate release. “Pakistan is a state party to the Convention on the Rights of the Child and the International Covenant on Civil and Political Rights, which oblige authorities to protect religious minorities under international law,” he said. After Gajri disappeared on December 21st from southern Punjab, on December 26th the local police station received a letter from the madrassa administrator stating that Gajri had embraced Islam and had married her neighbour Mohammed Salim. However, the letter was not enclosed with a marriage certificate. The police failed to immediately inform Gajri’s parents of the letter they had received even though her parents had attempted to file a report when she first went missing. The parents were discouraged from filing a report, according to Burney. After feeling helpless, Gajri’s parent’s went to Ramesh Jay Pal, the vice president of the National Peace Committee For Interfaith Harmony, asking him for his advice on the matter. 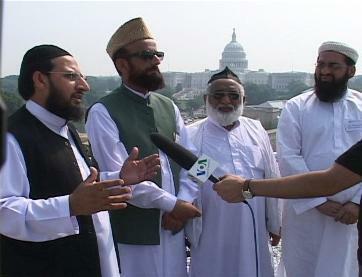 With Pal’s help, Gajri’s parents met the priest, Maulana Abdul Hafeez, in charge of Darul-Uloom Madrassa in Khanpur. He told them that their daughter had embraced Islam and that she was not allowed to meet her parents. Courtesy : The Chakra News. 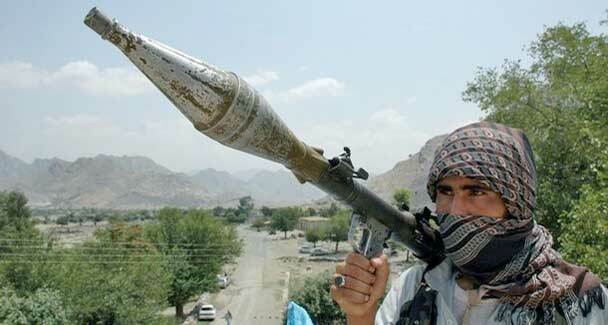 PESHAWAR: Pakistani military officials said nine soldiers were killed Monday in the deadliest battle to date for security forces in a nearly two-month operation against the Taliban in the tribal belt. 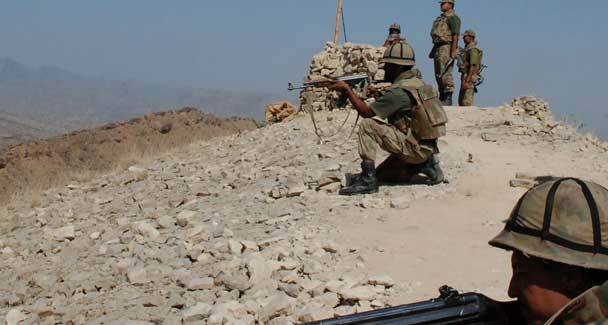 Military officials described the battle near Daburi in Orakzai district as “fierce” and said two officers were among the nine who died. They also told AFP that 37 militants were “reportedly” killed and many injured. Orakzai is the latest district in northwest Pakistan’s semi-autonomous tribal area where the military has launched an operation to evict Taliban militants, under US pressure to eradicate the scourge of Islamist extremism. Despite death tolls released by military officials, it is impossible to confirm casualty statistics independently in what is a closed military zone inaccessible to aid workers and journalists.